On Sunday, June 3, we celebrated the second annual National Veteran’s Poetry contest at The General’s Residence, Fort Mason in San Francisco. The event, called The Soldier’s Journey was introduced by Richard Harrell, Executive Director. It was the culmination of a national poetry contest for veterans. Vets from all branches of Service were invited to submit poetry to a distinguished jury, which included local poet Lawrence Ferlinghetti, poet and author Major General John Borling, Rick Davis, poet Colonel David Rabb, and Poet Laureate of San Francisco Kim Shuck. The afternoon event honored the winners of the Poetry Contest, and provided music and poetry exploring war, peace, as well as soldiers’ experiences before, during and after battle. The winning entry was awarded to Bill Glose of Yorktown Virginia for his poem I.E.D. Mr. Glose won a $1,000.00 first prize for his work. 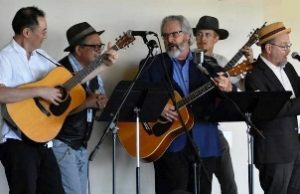 A special poem titled Four Angels was read by poet Robert Kaplan, dedicated to the three healthcare workers who recently lost their lives at The Pathway Home in Yountville. These brave women will long be remembered for their dedicated work with Veterans suffering the effects of PTSD. Guest readers included Kim Shuck, San Francisco Poet Laureate and Marine veteran Paul Cox, Director of the American Legion War Memorial commission. Kevin Fisher-Paulson, participated as both a reader and singer. Mr. Fisher-Paulson was Captain at the San Francisco County Jail, which has hosted Heroes’ Voices in providing music therapy and poetry writing for Veterans in their facility. Another moving guest reader was poet and Gold Star mother Mary Shea. Musical entertainment expressed the soldiers’ experiences through several wars, including World War I, World War II, and the Vietnam War. Musicians and soloists included Lynne Morrow, Director of the Oakland Symphony Chorus and Professor of Music at Sonoma State; Michael Conley, Music Director of Calvary Presbyterian Church; Larry Chung, Director of Heroes’ Voices Guitar Corps; and Guitar Corps veterans Todd Butillo and Joseph G. La Rocca. Read this year’s winning poems on our Poetry page.